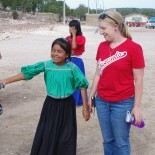 This summer, our hearts were overwhelmed with number of projects the missionaries dreamed of for Zacatecas. With this number of opportunities, our work will focus on three different types of ministry: College Ministry, La Vina Zacatecas, and Huichol. College Ministry: The church in Zacatecas is in a great location, near the University. The church offers a free Internet cafe for the students, which is a peaceful place for them to study. We want to use this avenue as a location for students to also meet Jesus and find solid Christian support. La Vina Zacatecas: With the fast growing church, we plan to do outreaches to the poorer families in the outlying areas of the city called colonias. We hope to plant new churches in these neighborhoods so that our ministry will be easily accessible. It will be a blessing to us to be part of a church that is truly alive. Huichol: We are most excited about the privilege to work with an indigenous tribe called the Huichol. They’re an unreached people group for the Gospel, meaning there are not enough Christians among the Huichol in this region to evangelize their own people. Basic resources for this tribe are severely lacking. This first location for our journey as missionaries is going to focused upon learning and sharpening our skills in the ministry. We are excited to work with Juan & Debbie Garza who are currently working in Zacatecas. We are also looking forward to working with Lowel & Sherri Glick who are traveling to see the Huichol indians.